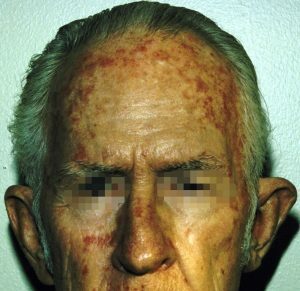 Actinic Keratosis (AK) is a scaly spot found on sun-damaged skin. Also known as solar keratosis, it is a precancerous or an early form of cutaneous squamous cell carcinoma. Many patients who get Actinic Keratosis have fair skin. Most people see their first Actinic Keratoses after 40 years of age because Actinic Keratoses tend to develop after years of sun exposure. Actinic Keratoses usually form on the parts of the body that get a lot of sun exposure, such as the head, neck, hands, and forearms. Because it can progress to a type of skin cancer called squamous cell carcinoma (SCC), treatment is important. Ultraviolet (UV) rays from the sun or indoor tanning can severely damage skin and cause an Actinic Keratosis to form. Most people get more than one Actinic Keratosis. When you have more than one Actinic Keratosis, you have actinic keratoses. Anyone who has many Actinic Keratosis should be under a dermatologist’s care. Most people who have many Actinic Keratoses continue to get new Actinic Keratoses for life. Left untreated, Actinic Keratosis may turn into a type of skin cancer called squamous cell carcinoma. Untreated lesions have up to a 20% risk of progression to squamous cell carcinoma. We can treat Actinic Keratoses before they become skin cancer. Also, regular visits allow our doctors to catch and treat Actinic Keratosis that becomes skin cancer. Screening for Skin Cancer is an essential step in prevention. During your acne appointment, Dr. Eric Tabor or Dr. Pate and one of their certified Nurse Practitioners, Physician Assistants or Aestheticians will help create a treatment plan individualized to meet your specific needs.